Gallery sitting for Gay, Jewish, or Both? Today I’m gallery sitting at Napoleon for the first time in a month. The current show is a collaborative installation by artist Leslie Friedman and designer Bernardo Margulis titled Gay, Jewish, or Both. The installation transforms the gallery into a domestic space that examines Gay and Jewish identity through color, symbols, sculpture, Warholian-inspired Screen prints, plants, found objects, and found photographs. The show is as full of objects as a domestic dining/living room would be. 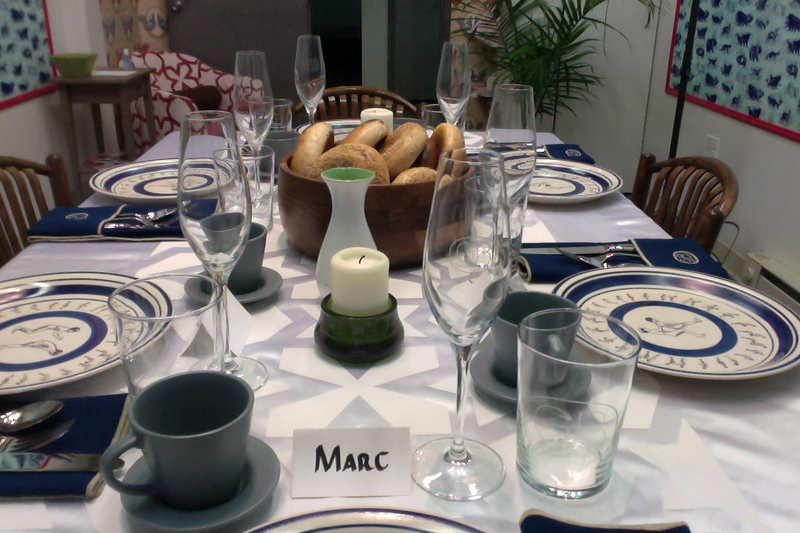 The centerpiece for the installation is a dining room table set with monogrammed glassware and patterned flatware. The table functions as a stage where communities can come together and celebrate their likeness and difference. Even though much of my identity is not constructed through either of these communities, I’m touched by the work present and feel as certain kinship to it. Oh, and I like that I have a place at this table.